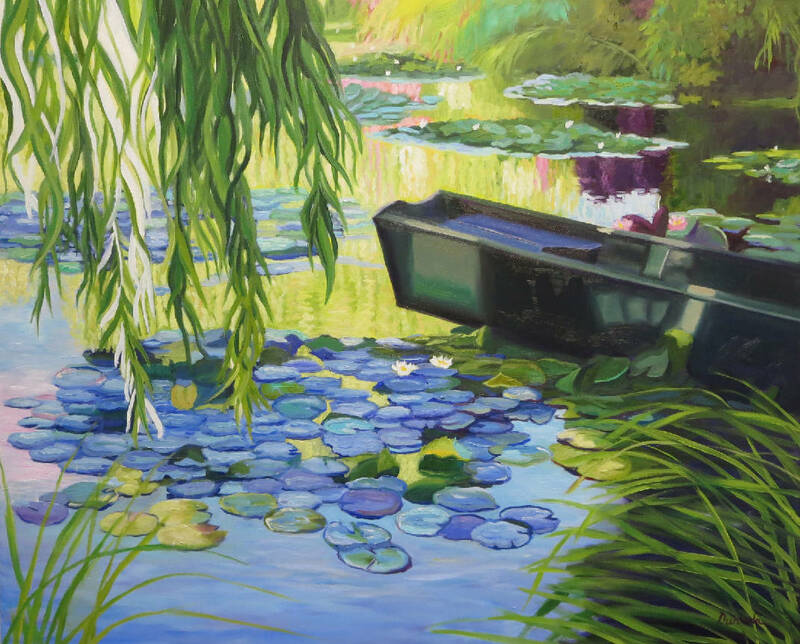 "Gardener's Boat," an oil painting by Durinda Cheek. "Afternoon in Giverny," an oil painting &#0010;by Joyce Jones. › When: Through Wednesday, Oct. 31. Open 10 a.m.-5 p.m. Tuesday-Friday. › Where: Ringgold Art & Frame, 7825 Nashville St., Ringgold, Georgia. A weeklong painting workshop in Giverny, France, home of French impressionist painter Claude Monet, has produced a treasure trove of works by a group of area painters. 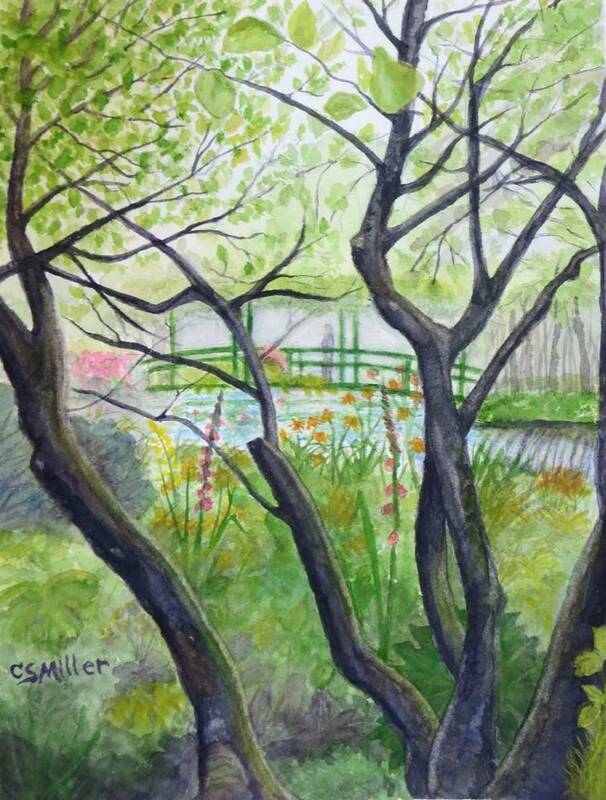 Their "Impressions of Monet's Garden" is on view through the end of the month at Ringgold Art & Frame. Instructor Durinda Cheek of Ringgold, Georgia, led the group, which included Sandra Babb of Ringgold; Dorothy Powell of Dalton, Georgia; Joyce Jones of Chattanooga; and Susan Miller of McDonald, Tennessee. Rounding out the group were Jo Thomas, a former Chattanoogan now living in Vermont, Judy Rogers of Indiana and Emi Anamizu of Oahu, Hawaii. The Ringgold show consists of works based on the experiences of the week. Some are paintings created on-site while others are larger pieces that are based on sketches and plein air paintings while there. Among the works on exhibit are acrylics, graphite, oils, pastels, photography and stained glass. The artists stayed in a converted mill adjacent to Monet's property. Each day they were allowed to paint in Monet's garden before it opened to the public and again in the evening after it was closed. This allowed the painters to have the early morning light and the warm evening light in which to paint. Painting en plein air (French for "in the open air") was how Monet and other impressionist painters worked to capture the fleeting light. Monet (1840-1926) purchased the house and property in the village of Giverny in 1883, according to historians. He loved color and flowers and soon set out to create gardens that would bloom almost year-round to serve as his subject matter. He also admired the Japanese sense of design and had a Japanese-style bridge built over a pond of water lilies and iris. 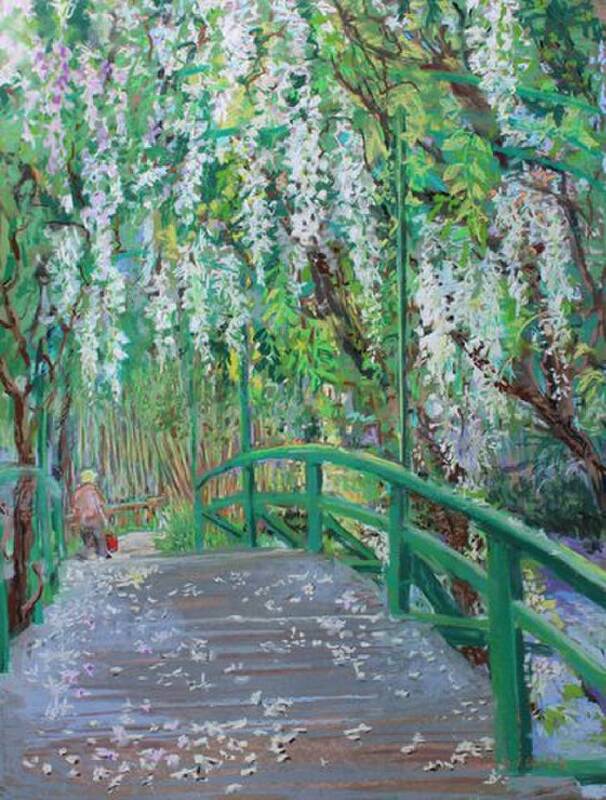 He lived there 43 years and painted daily, taking his inspiration from the gardens he created. Today the gardens and house are operated by the Foundation Claude Monet. When not in the iconic garden, the painters traveled to nearby Lavacourt, where Monet painted the village of Vetheuil along the Seine River, in the courtyard of the Baudy Hotel, where the other Impressionist painters of the 1880s stayed, and the village streets of Giverny. The group also took a day to visit Auvers where Vincent Van Gogh stayed before his death and where he is buried. One day was spent enjoying the outdoor market in the town of Vernon where live animals are sold for later meals, Cheek says. Cheek teaches painting and sketching at Townsend Atelier in Chattanooga and offers one painting workshop abroad each year. 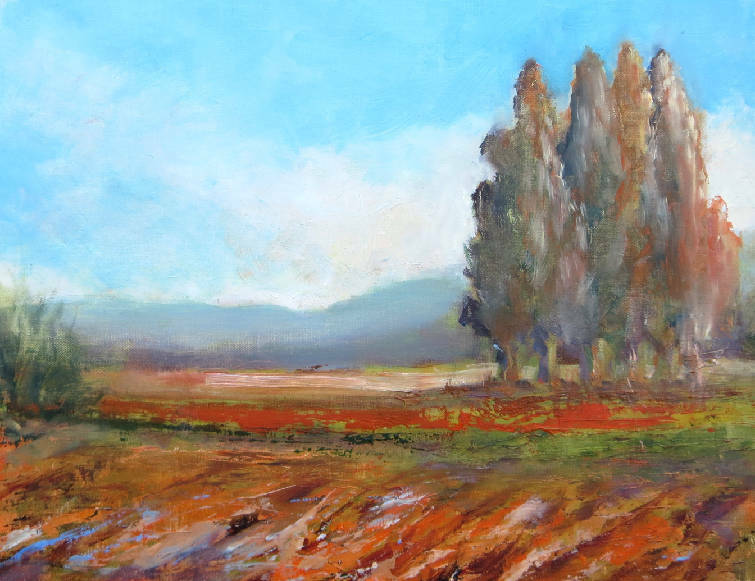 Capturing the Romance of Tuscany will be June 2019; the next Painting With Monet session will be in the spring of 2020.